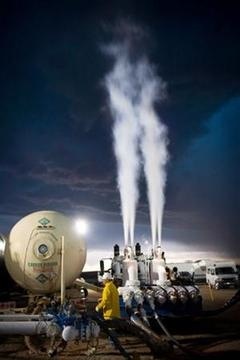 The RCR-AGT process reduces contamination in frac water by between 91.6% to 97 %. Our propriety system treats high levels of Chloride and Total Dissolved Solids (TDS) in Frac water; our process reaction significantly neutralizes metallic salts and sulfates. Dissolved species of minerals and gases in the water in these areas also cause an increase in the formation of vapor cavities. When these cavities collapse, localized areas of high temperature and pressure exist which enhance reduction and oxidation (redox) chemical reactions. The generation of high temperatures and pressure also induce cleavage of water molecules. This results in the formation of free radicals. Oxidation rates of dissolved metals (Aluminum, Magnesium, Strontium, Manganese, Sodium, Potassium, Barium, Iron, etc.) and salts (Sulfates, Chlorides, etc.) are enhanced by the formation of the above free radicals with a reaction time that is orders of magnitude faster as compared to theoretical oxidation rates. The addition of an alkalizing agent to the reactor can also increase precipitation of dissolved solids even faster. The RCR-AGT system is a simple and extremely effective way to treat Frac water by removing dissolved and suspended solids (TDS) to a level where the water may be acceptable for re-use. The system precipitates metallic salts and sulfates. Frac flow back pit water will be treated to remove all heavy metals (iron (Fe) and aluminum (Al)) and dissolved chemicals (Sulfur). Where the Marcellus shale is present, the Frac water has similar items such as pyrite and sulfides, found in AMD (acid mine drainage). Our process system has been successful in treating Acid Mine Discharge and removed the same metals that are present in Frac water. Our process has been successful in treating Acid Mine Discharge and removed the same metals that are present in WV Category 3 Frac water and Marcellus pit water by 95-96%. Successful implementation of frac flowback water recycling will minimize water use, water acquisition costs, disposal costs, and truck traffic. The economic recycling of frac water flowback water will increase efficiencies in fracture treatment by lowering water acquisition and transportation costs. It will reduce overall truck traffic, which in turn will reduce dust that can be a significant impact to local residents. 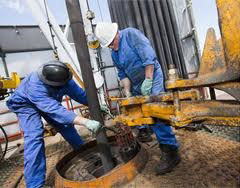 The economic reuse of frac water flowback water will also reduce disposal costs, which improves the economics of oil exploration that will free up capital to invest in more exploration.